URBAN RIGGER is a unique, design protected, patented, floating, flexible, CO2 neutral and mobile property, totalling 745 m2 spread over 300 m2 of housing (9 + 3 individual student residences of respectively 23m2 – 27m2), a 160 m2 shared green courtyard, kayak dock, bathing platform and BBQ area, as well as 65 m2 communal roof terrace. Downstairs, below sea level, the 220 m2 pontoon (basement) is comprising of 12 storage rooms, a big lounge area plus kitchen, a technical room and a shared fully automated laundry. Cities across the world are striving to achieve many of the same objectives for their waterfronts. They seek a waterfront that is a place of public enjoyment, and want a waterfront that serves more than one purpose: People want a place to work and to live, as well as a place to play. Accordingly, a place that contributes to the quality of life in all of its aspects; economic, social and cultural. World renowned architect Bjarke Ingels designed URBAN RIGGER. 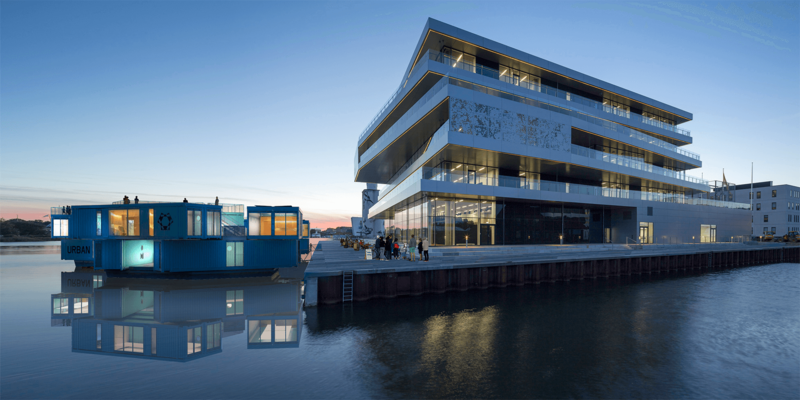 By using the additional building principles for connectivity he achieved unprecedented flexibility in the floating elements, so that the concept can easily be assembled in floating apartment blocks of varying size as needed and desired. URBAN RIGGER can be located anywhere with water access, and can easily be moved to wherever housing is needed but space is limited.